Following the success of his recent book, 'A Brush With The Avon', John has spent the last twelve months writing and compiling this beautifully produced new book, covering all aspects of fishing for chalkstream roach. Brought together in the pages of this book are some of the most successful roach anglers ever to have fished these wonderful rivers in the history of the sport, with a truly amazing tally of two and even three pound roach to their credit. 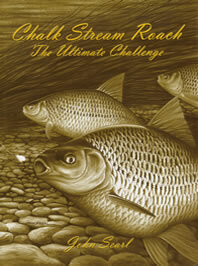 All of the major chalkstreams have been covered by an angler who has specialised on a particular river. Most of these anglers will be very familiar to the reader; anglers like Dave Steuart, Dave Howes, Ron Smith, Mark Wintle, and of course John Searl, will need no introduction. A forward by Peter Wheat, and an introduction by John Bailey, are also testament indeed to the quaility of this book; both being great roach anglers in their own right. Every aspect and style of roach fishing has been covered, from trotting and stalking in Summer and Autumn, to traditional bread-fishing in Winter. No expense has been spared in the production of this book, which is sure to become a 'must have' for all serious roach anglers and collectors alike. Printed in full colour throughout, with colour photographs throughout and many of John Searl's illustrations. There will be 100 signed and numbered copies, bound in the finest Goat skin and Siltex, with guilt edges, hand made end papers, and protective slip case. There will also be 900 hardbacks, each individually numbered. The leatherbound copies will retail at £180.00 each, plus £5.00 postage and packaging. The hardbacks will retail at 35.00 each, plus £5.00 postage and packaging.